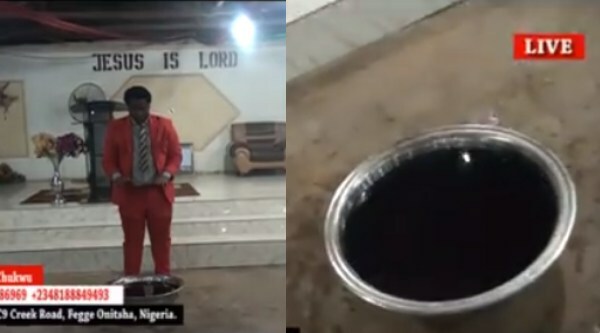 A Nigerian Pastor, Identified as Ebelenna Chukwu has reportedly turned water to wine at his church in Anambra state. Water turned into wine live in the Church Programme. If you don’t believe you are Anti Christ. Mark 9:23 Jesus said unto him, If thou canst believe, all things are possible to him that believeth. John 14:12 Verily, verily, I say unto you, He that believeth on me, the works that I do shall he do also; and greater works than these shall he do; because I go unto my Father.John 20:29 Jesus saith unto him, Thomas, because thou hast seen me, thou hast believed: blessed are they that have not seen, and yet have believed. Romans 8:24 For we are saved by hope: but hope that is seen is not hope: for what a man seeth, why doth he yet hope for? 8:25 But if we hope for that we see not, then do we with patience wait for it.